Okay, so last week my daughter, who is in first grade, came home and said that the mother of one of her classmates came in to talk to them and she showed me this little booklet. In it, it talked about people in a community and the things they do to help each other and to take care of the community. I have since learned that this a K-12 entrepreneurship program that is very popular with many parents, but something about it all just irked me. …Our volunteer-delivered, kindergarten-12th grade programs foster work-readiness, entrepreneurship and financial literacy skills, and use experiential learning to inspire students to dream big and reach their potential. 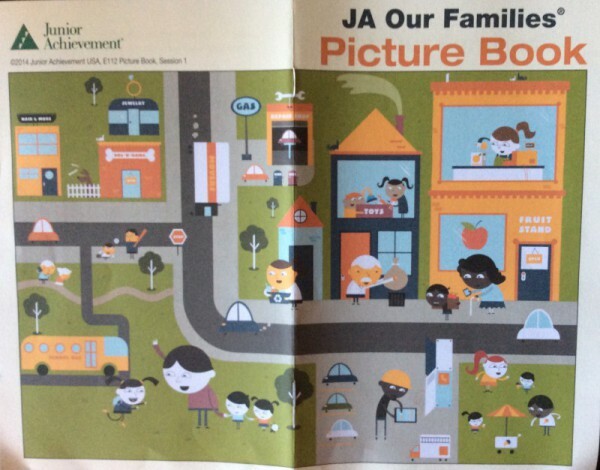 With the help of more than 213,000 volunteers, JA students develop the skills they need to experience the realities and opportunities of work and entrepreneurship in the 21st century global marketplace. This program is sold as a way to introduce children, starting in Kindergarten, how to understand wants versus needs and to figure out what kind of job they can do and the skills they will need to develop, or what kind of business they can start that will bring them success. Why is it necessary start this “career readiness” so early on? Besides, don’t students learn about communities, from the local on up to the big wide world, as part of history and social studies? And, since they are in Catholic school, won’t they learn about being helpful neighbors in their community by knowing that Jesus taught us to love our neighbors as ourselves and do unto others as we would have them do unto us? Maybe I’m just not getting it. Here is a sample of the program from a Catholic school in Rochester, NY. According to the Junior Achievement website, “classroom volunteers transform the key concepts of our lessons into a message that inspires and empowers students to believe in themselves, showing them they can make a difference in the world.” It strikes as being philosophically rooted in materialism and brings to mind the ‘Everything is Awesome’ world from the Lego movie. For Catholic students, in terms of spiritual growth, what does it mean to believe “in yourself?” What about reinforcing a belief in God and a firm reliance on Him for guidance on how they will “make a difference in the world?” Do the classroom volunteers interject and remind the children that God willed each one of them into being and that they will finding meaningful work that allows them to provide for themselves and their families while serving God and their fellow man? For Christians, success should be much more than merely finding temporal work. And what about vocations and callings that transcend the “global marketplace” like the priesthood or religious orders and the important role they serve in the community? Looking at the “Junior Achiever community” above, I see a lot of busy people and a lot of recycling and trash pick up going on, but what I don’t see in the busy Junior Achiever community is a church. Of course, since this is designed for secular education, if they put a church, they would probably have to depict all places of worship on the cover. But, I am not sending my daughter to public school. I am sending her to Catholic school. And if this program is so valuable to later “success” in this life, why can’t Catholic schools create their own version of this program that incorporates Catholic beliefs, values, and virtues? At least she knew these were “wants” and not “needs.” But, as her parents, we have already explained these things to her and she already does chores around the house. But for some reason, those of us who are responsible, engaged parents are being subjected to the “schools must also be parents because parents just don’t know” mentality that permeates education nowadays. 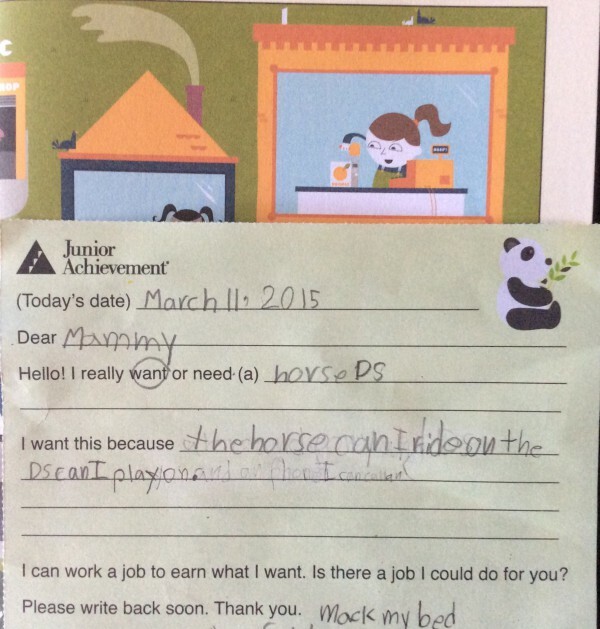 I did write her back and told her, much to her disappointment, that she is not going to get a horse or a DS for making her bed. All this aligns very nicely with the Common Core world of “21st century skills” and preparing students for “jobs of the future.” It coordinates with the categorizing and sorting of the units of human capital (that would be the students – our children) to see where they fit as global citizens in a global marketplace.